Despite STS-131’s slip to April, managers are continuing to push forward with plans to launch Atlantis on STS-132 the following month, on May 14. Dependant on Discovery launching in early April, Atlantis will target two launch windows – with a Soyuz-related Dual Docked Operations (DDO) constraint sandwiched inbetween. Discovery’s slip from her March launch date came after a delay to her rollover to the Vehicle Assembly Building (VAB) due to low temperature constraints. Technically, the February 22 rollover schedule would have allowed for a late March launch target for the veteran orbiter. However, the slip to April 5 is based on the DDO constraint that relates to the issues of a Soyuz arriving at an ISS that is already hosting an orbiter. “Orbiter: OV-103 (OPF Bay 3): Rollover to the VAB has been delayed until NET Monday, February 22nd due to local weather conditions. 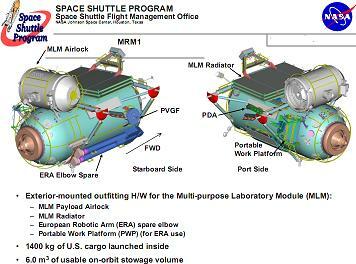 S0008 Shuttle Interface Test Call-to-Stations is planned for Thursday, February 25th,” noted the NASA Test Director (NTD) on the refined schedule that also includes rollout to the pad on March 2 and payload to the pad on around March 15. The April 5 target adds around 10 days of contingency to the flow, meaning a delay to the February 22 rollover schedule would not begin to impact the latest launch date for some time. “The Shuttle and Station Programs met to discuss launch dates in light of the fact that Discovery has still not rolled over to the VAB for stacking (weather related issues) and can no longer meet the scheduled March 18 launch date,” added the SSP (Space Shuttle Program) in an address acquired by L2. 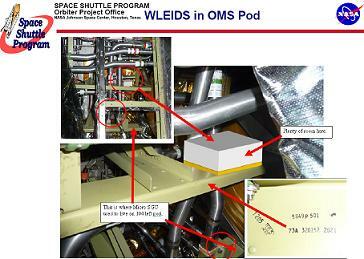 The slip holds several benefits for Discovery and her hardware, as more time is allowed for work to take place on installing additional sensors related to gaining data on the Main Engine Ignition (MEI) Acoustic and SSME (Space Shuttle Main Engine) Ignition Overpressure (IOP) Environments, and for additional plug pull tests on External Tank ET-135’s intertank. Work on carrying out tests on the additional areas of the intertank – related to a number of foam loss events from this region during the last few flights – has already started, via the erection of access platforms in High Bay 3 (HB-3). “ET-135/SRB BI-142 / RSRM 110 (VAB HB-3): Intertank Plug Pulls; Scaffolding installation is complete. Enclosure erecting, Plug pull layout and Intertank conditioning are all in work,” noted processing information on the tank, which was due to have been mated with Discovery by last week. In OPF-1 (Orbiter Processing Facility), Atlantis is being processing for her STS-132 mission that will be the 132nd flight of the Shuttle Program and the 34th shuttle flight dedicated to construction and outfitting of the International Space Station. The flight of Atlantis will utilize External Tank ET-136, Reusable Solid Rocket Motor set 111, Solid Rocket Booster BI set 143, and operational software OI-34. Processing has been going to plan, with the installation of Atlantis’ three Space Shuttle Main Engines (SSMEs) set to take place next Monday. “Orbiter: OV-104 (OPF Bay 1): RMS (Remote Manipulator System) turnaround test was successfully completed. MPS (Main Propulsion System) Flow Control Valves (FCVs) installation and leak checks were completed Tuesday,” noted NTD processing information. Initially, MOD managers had noted that STS-132 would likely slip to June, based on STS-131’s move to April and single pad turnaround operations. However, STS-132’s shuttle flight manager, Steve Gaylor, dismissed the slip, claiming they are very much on for May still – although they will only have six days to play with, given it takes 33 days to turnaround a pad, and only 39 days would separate STS-131 and STS-132 if Discovery launches on the first attempt. (See updated screenshots from the latest FAWG all flights manifest (L2) showing slip to STS-131, no slip to STS-132 at this time). 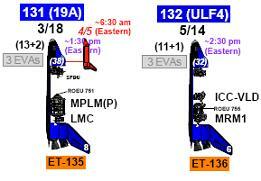 STS-132 will have an opening window of six days, prior to an automatic 10 day standdown if that opportunity is missed. This is again based on the DDO constraint relating to the undocking and docking of two Soyuz vehicles. The second window ranges from May 30 to June 5. Later in the month, a Beta Angle Cutoff comes into effect between June 12 and July 1. “The Programs did decide to avoid Dual Docked Operations (DDO) for STS-132/ULF4; this includes both the Soyuz 21S undocking and Soyuz 23S docking,” added Mr Gaylor. Meanwhile, STS-132’s tank remains on a good schedule to support STS-132, as it closes in on its shipping date from the Michoud Assembly Facility (MAF) in New Orleans. “ET-136: This tank is in Building 420. All nominal activities are in flow. There are three more BX sprays remaining. Critical Path/All Systems testing (have begun),” added ET processing information via the Shuttle Standup/Integration report (L2).